All our cold-water taps provide soft, potable drinking-water. There is no need to buy multiple plastic bottles of drinking water for your camping trip - please just bring a single re-fillable bottle and use our taps! We sell bags of kiln-dried logs for your campfire. 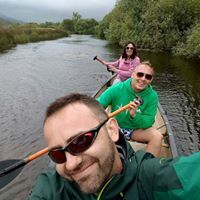 Half of the £4 price will be sent to Obóz dla Puszczy, an amazing group of people based in the Bialowieza forest in Eastern Poland, who continue to protect what is probably the most important area of ancient lowland forest in Western Europe from illegal logging by the current Polish government. Oboz dla Puszczy (camp for the forest) have achieved great success, using non-violent direct action, and tireless data-collection to present to the European Court, who in turn have ruled against the Polish government. They work entirely on donations and voluntary help to carry out their work, and to fight the many court cases that come their way. Welcome to The Snowdon Inn Campsite. The campfields are situated along the bank of the river Seiont, which flows from the large lake (Llyn Padarn - just a hundred metres upstream) down to the sea at Caernarfon castle. As you can see from the picture above, there are fantastic views up the valley to Snowdon itself. Most of our 11 acres are managed for natural biodiversity, and, as such, the camping pitches are well-trimmed areas surrounded by uncut grassland. The cut pitches vary in size - from single tent pitches through to large pitches that can accommodate many tents. A fence seperates a portion of the field from the river - suitable for those, say, worried about small children and deep water. The campfields are serviced by a small (but lovely!) shower and toilet room - two of each - which is situated about a hundred metres away at the base of the main building. Here you will also find a washing-up area. There is no extra charge for these facilities. There is a very large and very deep pool in the river which is fantastic for WILD-SWIMMING. You can swim down river for a good half-mile, through our own natural lake surrounded by nesting herons! We have a great knowledge of the area, and are always happy to give advice and suggestions, and pore over maps, in order that you get the most out of your stay. We are pleased to announce that the BAKEHOUSE cafe will be opening in the main building in late Spring 2019. CAMPSITE RULES We are pretty laid-back, and hope that your camping experience with us will be exactly the same. You won’t find signs here giving you all kinds of orders and instructions. All we ask is that everyone here respects everyone else, and the place itself. NOISE This is a quiet campsite - definitely no electronic music. And while you can sit round a campfire all night if you wish - we ask that after 11pm you make sure that you are not disturbing your neighbours who may be asleep. Most of our guests have busy days in the hills and so need a good nights sleep! DOGS We welcome dogs if they are well-behaved. Dogs that bark all the time are not welcome, and owners who let their dogs wander around are not welcome. We ask that dogs are kept on leads/leashes while on the site, and on no account to leave any mess behind. We want children to be able to roll in any grass they wish without fear of finding something a dog left there!! FIRES You are most welcome to have a campfire - and most pitches have a fireplace already set up. If you bring your own fire then we need to make sure it won’t burn the grass (last season we had a major drought and had to ban fires for a while - but that is rare in this part of the world). You can bring your own wood, or you can buy wood on-site. ARRIVAL / DEPARTURE TIMES We are pretty relaxed. Arrival any time before 11pm. Please call the site office on arrival (number on the gate) and we’ll show you to your pitch. If your pitch is booked the next day then departure by midday. If not then stay a bit longer! BANK HOLIDAY WEEKENDS We are always very busy so you need to book a pitch. Inevitably the campsite is not quite as peaceful as usual. We charge a minimum of a three-night stay for bank-holiday weekends. 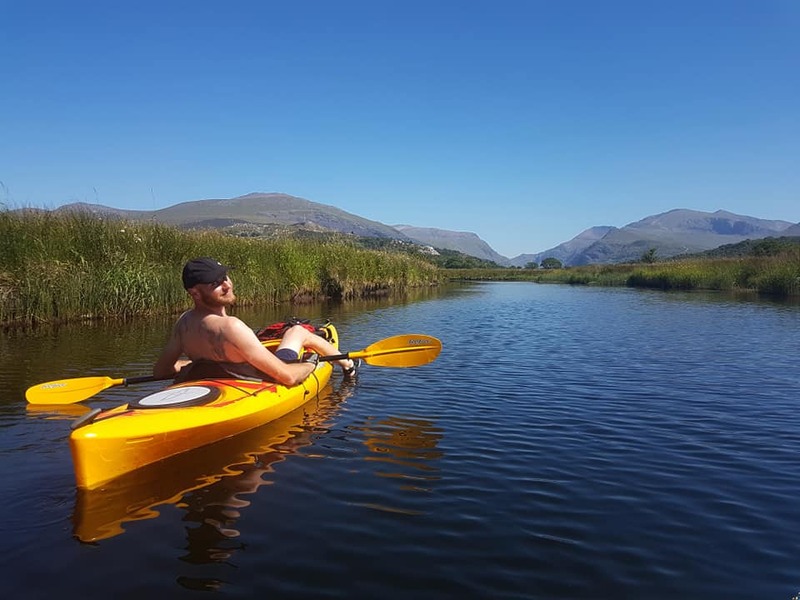 “Me and my 12year old son had a great couple of nights camping at Y Fricsan, which is in great location for Llanberis and of course Snowdon. Pitches are well maintained and the shower/toilet block very clean. “Perfect campsite. Right by the river. Swam every day. Only 2 toilets and showers but seemed plenty and kept spotlessly clean by the wonderful ted. you can buy bags of wood for fires in the old wheels. Take a break away from the hustle and bustle.